Happy 1/2 way through January to you, my friends! Can you believe that?!?! It's 1/2 way through the month already! Paddy and Mack get a few gifts from some loving friends and family each year. I encourage them to send handwritten thank you notes. Working on creating these notes for them to have ready to send, makes it easier to send them onto the thoughtful givers in their lives. I included a cute sleeve for the card to go in before we place it in an envelope. I like to include lots of pictures in my posts, but I know that can get lengthy. Instead, I have included a collage for you, and I will explain the steps for you. You can see how I assembled the card below. 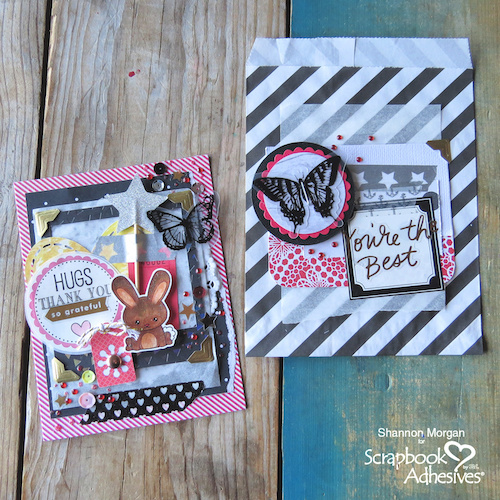 Gather up supplies for the card, mine included some patterned papers, embellishments, a card stock base for my card and of course Scrapbook Adhesives by 3L adhesives! Start by adding a contrasting layer, as I did, I stick to a lot of basic patterns (stripes, dots, basics) as they pair well together. I had a precut frame that I wanted to use, a lot of times you can find these within collections, or you can cut one out using a die cutting machine or a manual die cutter. I added a piece of tracing paper behind the frame. (The E-Z Runner® Micro Refillable Dispenser works perfectly for this.) I then added 3D Foam Squares, Black, Small size along the edge and flipped it over. Before adhering it to the card, I wanted to add some photo frames for an added detail. To accommodate the narrow corners at the top, I trimmed the photo corner in the picture as shown, this makes it possible to adhere to the frame without showing the backing of the photo corner. 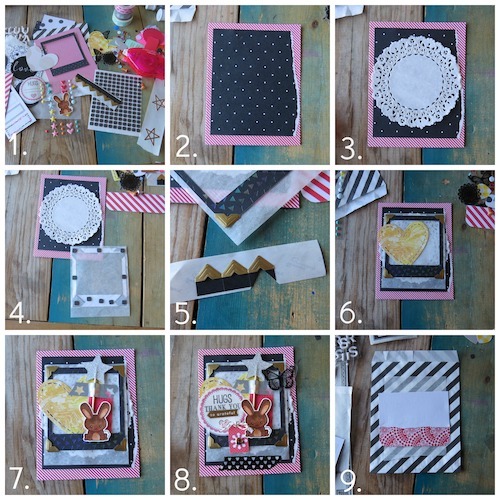 Go ahead and adhere the frame to the card front as shown, I then added a heart from my stash. I adhered it off center as shown. 7. This is the part of my card where I begun adhering things, here and there, perfectly imperfect. You will see a ticket, a cupcake topper star (which was adhered with a foam square) and taped down with some washi tape. There's also a bunny (which is a stamp) and you'll see even more details added in the next shot. 8. 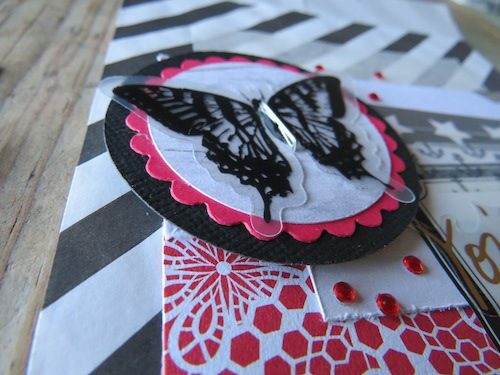 There are a few more details added, I wanted to fill the card with sweet details. There's a dainty tag, some washi tape, a butterfly tucked in the corner, and lastly the sentiment. 9. I created the sleeve, this is actually a paper bag (you could find it on etsy or other craft supply stores), with some details added to it. I added a few layers and then added a butterfly in the upper left corner. Here are a few close ups of the details on this card and sleeve. Thank you for letting me share with you! 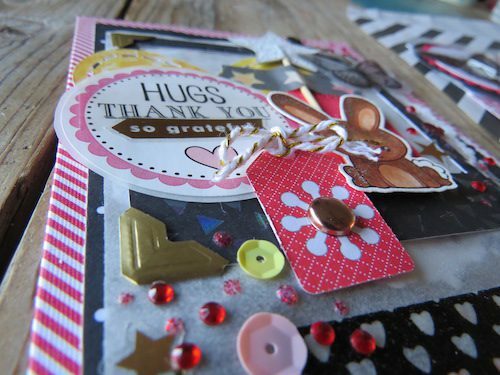 Thank you notes are always nice to have on hand, I hope I have inspired you to build your stash! Thank You Notes That Pop!